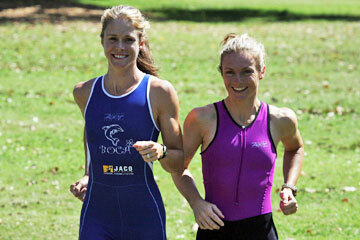 Rachel Ross, left, and Ingrid Rolles, prepare for the Ko Olina Triathlon with a run at Ala Moana Beach Park. Ross is trying to top her finish in last year's event, when she placed second behind an Australian competitor. Rolles won the female division in 2004. Twelve-year-old Devin Rettke refuses to let Type 1 diabetes rule his life. Despite the constant monitoring of his blood levels and the insulin pump he wears, he intends to compete in his first swim-bike-run triathlon today. "I thought it would be cool that a diabetic would be doing a triathlon," he said, "to show that diabetics can be like normal kids." The fourth annual Ko Olina Triathlon sets itself apart in many ways, including its commitment to raise funds for diabetes research. Thanks to a strong turnout from local and international athletes and an assembly of generous sponsors, the race donated $20,000 to the Hawaii Chapter of the Juvenile Diabetes Research Foundation and Ko Olina Charities last year. Another unique element is that it's really two events. The first part today is the Jamba Juice Keiki Triathlon Championships -- the culmination of the triathlon series for kids. Tomorrow, athletes from New Zealand, Australia, England and the mainland will join Hawaii competitors in a broken 650-meter swim, 18.6-mile bike ride and 4.5-mile run. Unlike the typical amateur race, prize money, restaurant certificates and gourmet food await at the finish line. Officials estimate about 650 people will participate in both the keiki and adult races. Devin discovered the event when he saw posters and flyers in Jamba Juice while ordering his favorite "enlightened" smoothie. He noted that proceeds went to JDRF, and decided he should partake. But the event will be especially challenging for Devin, who ran the Niketown 5K and has added swimming and riding a borrowed bicycle to his training regimen. "Any time he engages in an athletic activity, it's very difficult to monitor his blood level," said his mother, Lisa Rettke. "The tricky part with the triathlon is there's no way to check while he's doing it." His insulin pump will be disconnected before the race, and "afterward, he will have to test immediately." Because Devin has a soccer game later in the day, his mother said they'll have to test him a minimum of 15 to 20 times, including two to three times during the night. Even up to three days after this amount of activity, "he will have serious lows" and risk falling into a diabetic coma without diligent monitoring. Before his diagnosis in May 2004, Lisa noticed behavior changes, irritability and fatigue in her son. She thought that Devin's father's deployment to Afghanistan, where he served as a pediatrician, might be the cause. But Devin was also drinking copious amounts of fluids and eating more without gaining weight. "Even though it's 24/7, we refuse to give into it," said Lisa, who emphasized that insulin is merely a treatment and not a cure. "And that's what he wants to prove to everybody. That he can be just as normal as everyone else." Along the way, the sixth-grader at Holy Family Catholic Academy hopes to inspire other kids dealing with similar life-threatening situations. "They'll think that if I can do it," he said, "then they can probably do it." 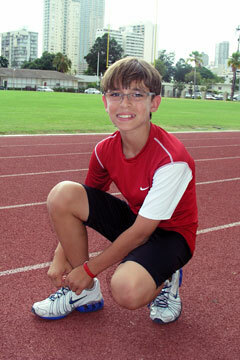 Devin Rettke, 12, has Type 1 diabetes, and will enter his first keiki triathlon today at Ko Olina. THE RACE STARTED with Peter Bourne's dream of organizing a triathlon on the grounds of the Ko Olina Resort & Marina. When he conceived the idea and approached restaurant owner/operator and fellow cyclist Scott Rolles to help, Scott and his wife, triathlete Ingrid Rolles, took it to another level. After watching Scott Rolles' son struggle with diabetes, they wanted to associate the event with a mission: to raise money for diabetes research. "We certainly don't do it for profit," said Scott Rolles, who produces the race with Bourne, Mike Nelson and JJ Johnson. "It's brain damage to try to do that. But this is not just a nice cause for me -- it's my son's life." The event's significant contribution to the Juvenile Diabetes Research Foundation is a key reason Jamba Juice supports the race with $15,000 in cash and in-kind contributions. "Our whole platform is health and fitness nutrition, with an emphasis on kids," said Sherri Rigg, director of marketing for Jamba Juice and Starbucks. While a sweet fruit smoothie might not seem a good choice for a child who must watch sugars and carbs, many Jamba Juice drinks, such as the enlightened smoothies, are acceptable. Jamba Juice provides several varieties of smoothies for athletes at the end of the race. "So much of (good health) is lifestyle," said Rigg, who noted that the children of Hawaiian and Asian ancestry are more prone to getting Type 2 diabetes. "Our big thing is to get kids moving, and one way to do that is to work with the families." Top Hawaii triathletes Rachel Ross, left, will compete in the Ironman Triathlon World Championships on Oct. 21, and Ingrid Rolles will race in the XTERRA World Championships the following week. RACHEL ROSS, a top Hawaii triathlete preparing for the Ironman Triathlon World Championships on Oct. 21, said she and her husband and three young children have planned their entire weekend around the events. Her 6-year-old son, Henry, wants to compete in the keiki triathlon series next year, so she plans to bring him out today to watch while she volunteers. Tomorrow, her children will cheer while Ross tries to improve on last year's performance, when she placed second overall in the women's division, 10 seconds behind an Australian competitor. Race producer JJ Johnson said that several families have kids participating today on their own, then joining their parents tomorrow on a relay. According to Ross, one of the toughest parts of the race -- which, ironically, also makes it perfect for first-timers -- is the safe, shallow swim portion. Athletes stroke 650 meters through four different shallow lagoons, requiring them to run between each. "It's harder than I thought it would be," said Ross, who thought her long stride would enable her to make up ground she lost in the water. "But it was hard to run. I was really out of breath." Ross, who is training 200 miles a week on the bike and 50 to 60 running, believes this is the perfect tune-up two weeks before Ironman. For everybody else, there's the sheer beauty of the locale and the good causes. "Everyone loves the venue," said Mike Nelson, vice president of Ko Olina Resort & Marina. "There aren't many locations anywhere in the state that you can have the security and privacy that Ko Olina provides to an event." According to Nelson, money from the event also goes to several programs within Ko Olina Charities. One of those will offer a special meal to 5,000 people at Waipahu and Makaha churches the weekend before Thanksgiving. And of course, the bulk of the proceeds go to helping people like Devin find a cure for diabetes.